If you thought there were quite enough smartphone operating systems doing the rounds at the moment, then you might wonder what on earth Samsung is doing launching yet another one.Samsung thinks that having its own operating system will give it some clout and the OS, called Bada, is destined to roll out across the full range of Samsung handsets. If you thought there were quite enough smartphone operating systems doing the rounds at the moment, then you might wonder what on earth Samsung is doing launching yet another one. Samsung thinks that having its own operating system will give it some clout and the OS, called Bada, is destined to roll out across the full range of Samsung handsets. A key feature here will be that every handset in the Samsung portfolio will have access to features like its app store. Samsung is betting this will help it establish a real presence in what is a very competitive sector. The handset looks great and feels good in the hand. At 118mm x 56mm x 11mm it is on a par with other smartphones, and the build quality is very good. The screen is superbly sharp and bright. The Super AMOLED technology ensures it is crystal clear to read – it is one of the best smartphone screens we’ve seen, and it is very responsive to the finger. A key factor in Bada’s success will be its usability, and it does well on this front. It embeds an updated version of Samsung’s TouchWiz interface for smartphones, so those who are upgrading will find it familiar. And it borrows from Android’s conventions too offering things like a drop down menu for status reports and notifications, and multiple home screens. You start off with three home screens, and widgets can be placed on them all. You can add more home screens, topping out at ten, so you can customise things without feeling there is empty unused space. Samsung’s aim appears to have been to keep a very familiar feel to things while allowing for a degree of quirkiness. For example, the lock screen features a puzzle piece and a hole in the wallpaper that matches its shape. The puzzle piece displays a messages notification. To simply unlock the handset you sweep the screen anywhere. To go straight to messages you put the puzzle piece in its slot. Simple, clever, quirky, and fun. 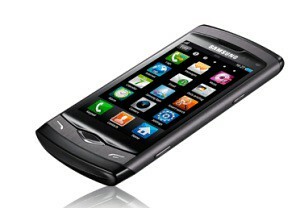 There is a strong consumer element to the Samsung Wave, with Twitter and Facebook apps built in. Video calling is supported by a front camera and there are plenty of shooting modes available to the main 5 megapixel camera (Portrait, Landscape, Night, Sports, Party/Indoor, Beach/Snow, Sunset, Dawn, Fall Colour, Firework, Text, Candlelight, Against Light). Video shooting is also gets a boost over many handsets with 1280 x 720 pixel resolution capability. The 1GHz Samsung made processor fairly whizzed along when we were testing this handset. We’ve no complaints on the speed front. With its familiar user interface and recognisable range of smartphone features many may well come to the Wave without realising it is the first time Samsung’s Bada operating system has been used. But for Samsung this is a watershed moment.